We explain the camera sensor technology used in todays digital cameras. Here's our complete guide to camera image sensor technology, the different types, and what it means to image quality. Image sensors are used in smartphones, cameras, video cameras, security cameras, action cameras, and in the automotive industry. The imaging sensor sits in the middle of your digital camera, right behind the lens, and turns the optical image into a digital version, converting light into electronic signals. The quality, size and make up of the image sensor, combined with the lens and image processor, play a massive part in the image quality produced by the camera. A sensor typically features an infrared filter, following by an anti-aliasing (or optical low-pass) filter, on top of the sensor. 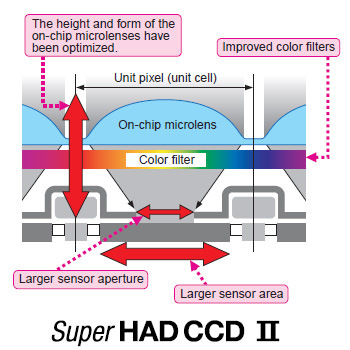 From Sony PDF: Super HAD CCD II Diagram. Side note: Sony HAD sensors use a variation of the bayer sensor pattern, and instead of having a square of red, green, blue, and green, they use red, green, blue and turquoise. More recently, Sony has again altered the colour filter and some of the latest sensors collect Red, Green, Blue and White for increased light sensitivity. More information here. Canon introduced gapless microlenses with the introduction of the Canon EOS 50D (2008), which removed the gap between the microlenses on the sensor, this means that more light is directed to the photodiode or pixel well, and means less amplification is needed, which in turn means an improvement in noise performance. This was further developed in the EOS 5D Mark II (2008) and EOS 7D (2009) with a reduction in the distance between the sensor and the gapless microlenses, further improving noise performance thanks to higher pixel sensitivity to light. The Canon EOS-1D X (2012) and EOS 5D Mark III (2012) also benefit from this technology. Olympus OM-D E-M1 Sensor, with central phase-detection focus. First introduced in the Fujifilm FinePix F300EXR (2010), phase-detection pixels are found on the sensor to improve focus speeds. It's also found on the Canon EOS 650D (2012), Olympus OM-D E-M1 (2013), and Canon EOS 70D (2013), and gives Digital SLRs quicker focus during live view and video, which is particularly useful, as DSLR cameras often have slower focus speeds when using live view. Canon's Phase-Detection sensor features a dual-pixel system that covers 80% of the sensor. 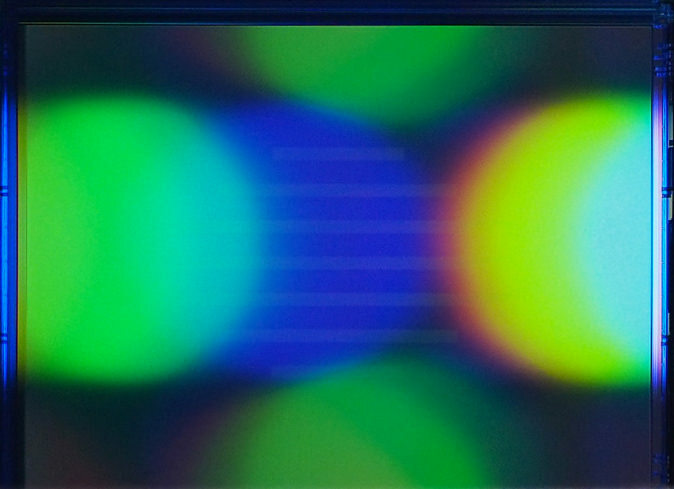 Canon call this system Dual Pixel AF, and each pixel features two photo diodes that can be read independently during autofocus or together to capture the image, as shown above. We got into more detail on the system in the full Canon EOS 70D review. Introduced with the Fujifilm X-Pro2 (2016), and Sony Alpha A6300 (2016), is the introducing of a new copper wiring process that enables a thinner wiring layer, which means that more light can get to the photodiode, which is also larger than previous sensors. The copper wiring also enables a faster readout from the sensor, which also enables 4K video recording (on the A6300). We thought we'd show the difference between a 12 megapixel CCD sensor, compared to a newer 12 megapixel BSI CMOS sensor, both 1/2.3inch in size. On the left is the result of shooting at ISO1600 with a Nikon Coolpix S2500, and on the right is the result of shooting at ISO1600 with a Panasonic Lumix TZ70. Click the image to view at full size. CMOS (Complementary Metal–Oxide–Semiconductor) sensors use less power than CCD sensors and often allow quicker read speeds than CCD sensors, allowing high speed continuous shooting and high speed FullHD video, as well as 4K video recording in some cameras. 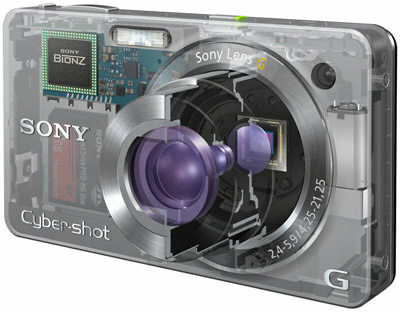 More information on CMOS technology can be found here: Exmor CMOS sensor (Sony's CMOS sensors). The majority of CMOS sensors use the Bayer filter pattern. Also known as B.S.I / Back Side Illuminated (Sony call it Exmor R / RS Backlit CMOS) and first introduced in 2009. BSI CMOS sensors are of particularly benefit to small sensors such as those found in camera phones, and compact cameras where the small size of the sensor means the sensor is mostly dominated by the wiring which blocks light from reaching the sensor. More recent developments has seen the use of Back-lit CMOS sensors used in APS-C CMOS sensors, as well as full-frame CMOS sensors for improved noise performance. 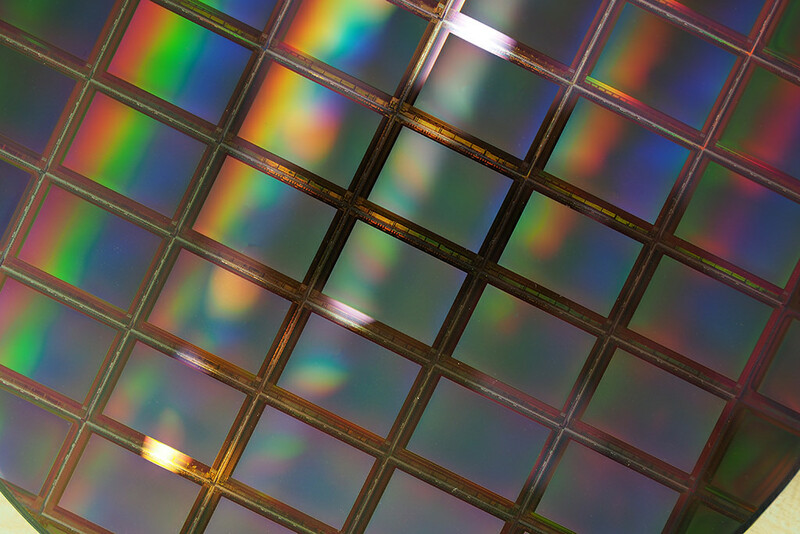 The majority of BSI CMOS sensors use the Bayer filter pattern. 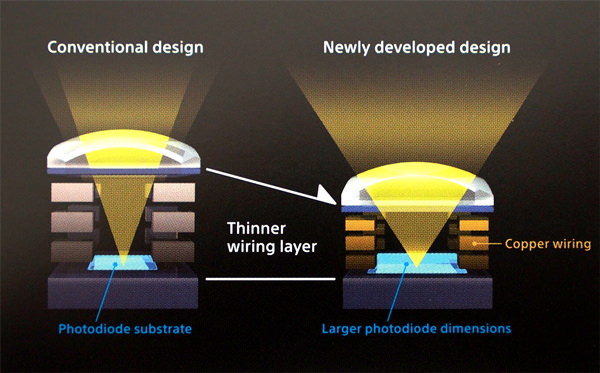 Recent developments in CMOS technology, by Sony, has seen additional image processing and memory being built into the back of the CMOS sensor, something not possible with CCD sensors. Sony has introduced a BSI Full-Frame sensor in the 42 megapixel Sony Alpha A7R Mark II. Using a "stacked" sensor has enabled even quicker continuous shooting as well as high speed video recording, as found in the Sony Cyber-shot RX10 II and RX100 IV. We thought we'd show an example of the difference between a standard CMOS sensor (Front-illuminated), compared to the BSI (Back-side illuminated) CMOS sensor, and have shown ISO6400 taken with the Sony Cyber-shot RX100, which features a 20 megapixel 1inch-type CMOS sensor, and the same subject and lighting conditions, taken with the Sony Cyber-shot RX100 Mark II, which features a 20 megapixel 1inch-type BSI CMOS sensor. Click the image to view at full size. 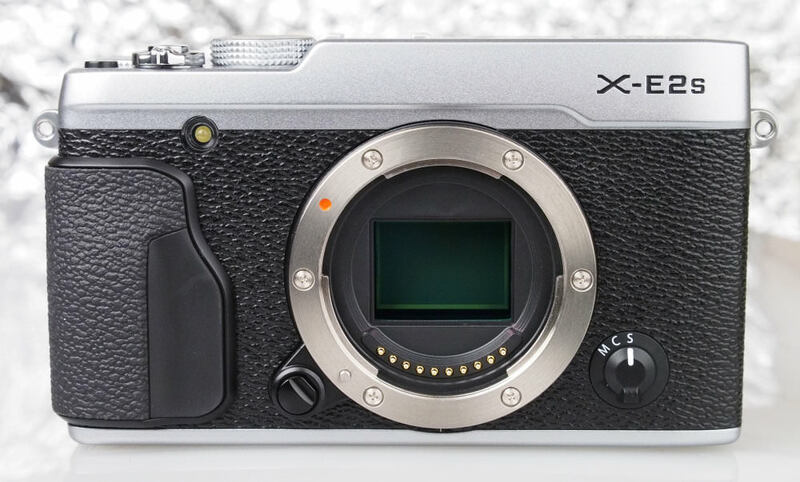 The latest sensor design from Fujifilm is the Fujifilm X-Trans CMOS sensor first introduced in the Fujifilm X-Pro1, and used in other X-Mount cameras. This uses a new arrangement of the colour filter on the sensor, said to mimic film, it is designed to improve detail capture, as well as reduce noise levels. 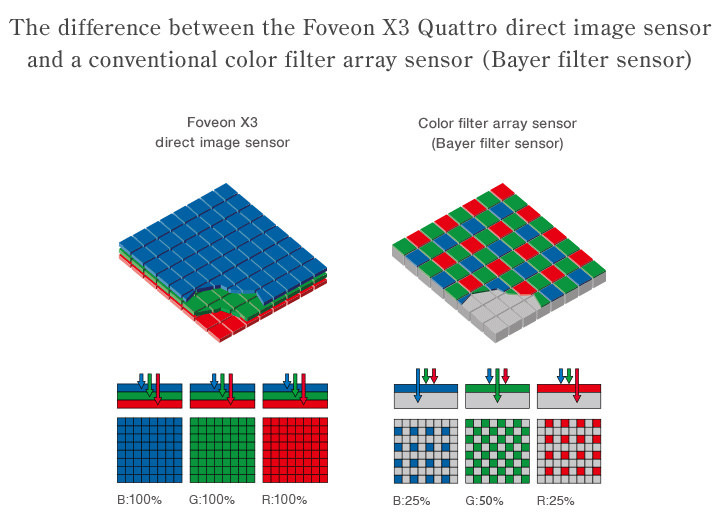 Fujifilm also say that false colour and moire is reduced by not using the standard Bayer filter array. Detail captured is improved by not using an Optical Low-Pass Filter (OLPF), also known as an Anti-Aliasing (AA) filter. X-Trans CMOS II and III - These incorporate phase-detection auto-focus at the sensor level. The X-Trans CMOS III is a new 24 megapixel version of the sensor, with copper wiring. 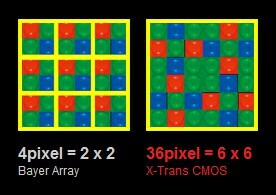 The EXR sensor is different from the Bayer sensor pattern, and Fujifilm has re-arranged the Red, Green, and Blue pixels to enable pixel combining: Super CCD EXR explained (PDF). 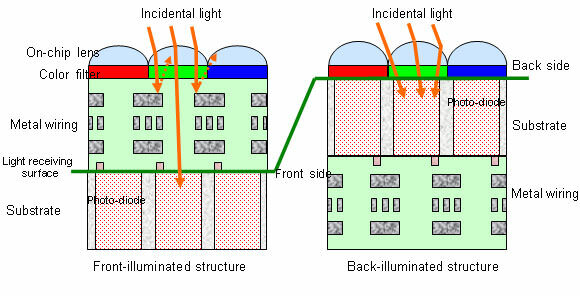 Image from Fujifilm (Whether EXR or Bayer pattern, the backlit technology is the same). Olympus and Panasonic use this name for their sensors, but there is little information on-line about the sensor technology. When used in compact cameras, it enables high speed shooting, much like backlit CMOS sensors. The sensors use the Bayer filter pattern. It is also used in Panasonic and Olympus Micro Four Thirds cameras such as the Panasonic Lumix G7. Departing from the standard Bayer sensor, the Foveon sensor is unique in that it has the Red, Green, and Blue pixels on top of each other, so that at each point the camera is reading the full colour. The benefits of this seem clear, however Foveon sensors are only used in Sigma cameras, which means that development of the sensor and technology seems to be at a slower pace compared to the speed of development of other sensors, for example sensors in mobile phones are sold in their billions every year. The Foveon X3 Quattro direct image sensor differs from the previous Foveon sensor thanks to a new top layer with a higher resolution, and lower layers with lower resolution. This is said to give high resolution results, but with a lower resolution green and red layer, that means image processing is said to be quicker and noise is also said to be improved. The Foveon X3 Quattro sensor is used in the Sigma dp Quattro range, and Sigma sd Quattro range. Image courtesy Leica Camera AG. A black and white sensor does not feature the Bayer colour filter, and is therefore able to record detail at every pixel. The black and white sensor can be found in specialist cameras, as well as the Leica M Monochrom with 18 megapixel CCD sensor, and Leica M Monochrom (Typ 246) with 24 megapixel CMOS sensor. Some smartphones have featured a secondary black and white camera, for example the Huawei Leica P9. 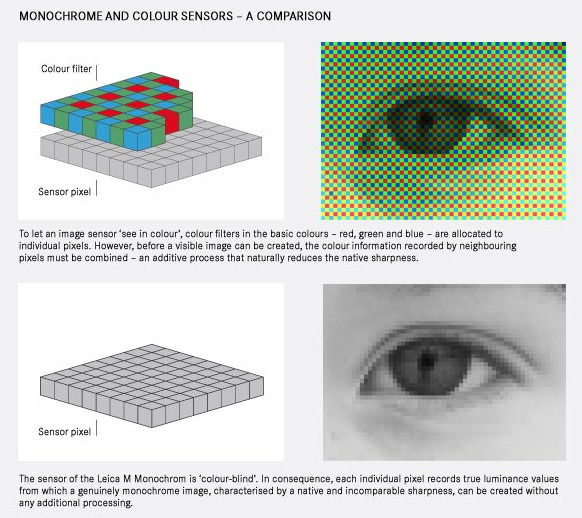 These are the different types of sensors available, CCD vs CMOS, as well as various technologies involved including Bayer and other colour filter arrays, and whether one is better than the other is regularly debated, with the lens and image processing playing a big part in the final image quality. For the most informed view on how a sensor performs, you need to have a look at the latest camera reviews of the model you're interested in, as the results from one sensor could be very different when used by one manufacturer over another. We have seen the switch to backlit CMOS sensors improve image quality, with lower noise at higher ISO settings, higher continuous shooting speeds, high speed video and other benefits such as quicker AF. Further developments have added on-sensor phase detection focus, copper wiring, as well as new and interesting arrangements of the colour filter array. Side note: Some camcorders use "3CCD" sensors - this is literally three different sensors, and in front is a prism that splits the light to red, green, and blue and sends each colour to an individual sensor.